We're two weeks into the new school year already! This year all three of my children are in different schools. This means three start times, three home times, and a bit of chaos in the mornings. I'm not a normal mom I guess in that I'm never excited about back to school. I miss my kids, and I'm soooo not a fan of packing lunches. Another thing I'm not a fan of with back to school is the little coloured slips of paper that inevitably come home announcing that another child in your child's class has lice, and requesting you to check your child's head before sending them back to school. Several years ago we dealt with lice for the first time, and it was horrific!!! I had never had that as a child, and as a result, I felt a HUGE stigma with it. It took several treatments with that toxic shampoo and a lot of tears to finally put it behind us. After that I really dug into researching how to better manage things if it were to happen again, and more importantly how to Prevent it from happening again. First off, a nit and lice comb is an absolute must. Physically removing them is job one. It's tedious and unpleasant, but absolutely 100% necessary. The next tool in my war against lice toolbox is Diatomaceous Earth, otherwise known as DE. There is a lot of information on this throughout the web. It can be taken internally as a detox agent, is used as an anti-caking agent in grains, and animal feed, and it's cost effective. It kills all insects mechanically. This sounds scary. I know. Microscopically it is very sharp, though to the feel for us, it's a soft, very fine dry powder...that will make your skin dry out if you handle it too much. This is how it kills insects. It scratches the waxy outer later of their 'armour' and they dry out. This is great news if you're battling lice! So what is DE anyway? It's a very light weight pale grey to whitish powder made of ground up fossilized diatoms; plant organisms from the ocean eons ago. Diatomaceous earth consists of fossilized remains of diatoms, a type of hard-shelled protists (chrysophytes). It is used as a filtration aid, mild abrasive in products including metal polishes and toothpaste, mechanical insecticide, absorbent for liquids, matting agent for coatings, reinforcing filler in plastics and rubber, anti-block in plastic films, porous support for chemical catalysts, cat litter, activator in blood clotting studies, a stabilizing component of dynamite, and a thermal insulator. It's good stuff...but you MUST be careful not to breath it in. As with any powder, if you breath it in it means trouble. So, how do you use DE to eliminate lice? This is how I have used it for more than one kid, and it worked like a charm!!! I take whatever shampoo you prefer, no need to buy anything special for this. Put about an ounce of it into a separate plastic squeeze bottle. Now you're going to add about an ounce of water to this to thin it out. I also dissolve a tablespoon of Epsom salts in the water I'm adding. I boil the kettle, and pour an ounce of hot water over the tablespoon of Epsom salts and stir to dissolve, then I add about a tablespoon of DE to that water as well before pouring it into the shampoo and shaking it up well. The Epsom salt provides a dose of magnesium to the scalp, which is a nice thing, but we really want it there to help draw the moisture from the nits and lice as they contact the DE. I then apply this shampoo to the dry hair at the roots and leave it on, covered with a shower cap or plastic bag for at least 30 minutes, or overnight if possible. Wash out as usual. The DE will do a number on long hair, so if you are dealing with long hair it's a good idea to use a really good conditioner after. Take a comb through it while the conditioner is in, and then finish with a cider vinegar rinse of about 1/4 cup cider vinegar in a pint of warm water. 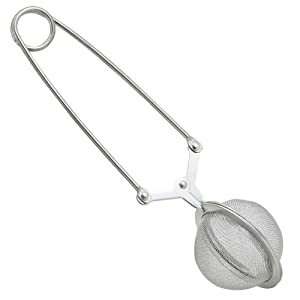 You just scoop up a bit of the DE in the tea ball and use that right near the scalp where they hide and lay their eggs on the shaft of the hair near the warm scalp. Work it in with your hands, and then after about 30 minutes or so you can apply the shampoo from above with more DE in it, and leave that on for another 30 minutes or more, and then wash out. This still has to be followed with the nit comb, unfortunately. I still have another trick in my toolkit for lice...and it is essential oils, but NOT tea tree. In my research I found a dog product for fleas that utilized cedarwood and peppermint essential oils. This is a FANTASTIC one two punch for both fleas and lice, as they each work a different way. Peppermint oil smells fantastic and works by causing the lice to close up their spiracles from which they breathe, leaving them to suffocate. The cedarwood, while it's not a favourite scent on its own for many people, smells wonderful with the peppermint oil. It's minty and woodsy, and all kinds of festive wonderful. The cedarwood oil works to break down the waxy layer on 'exoskeleton' of the bugs. To use the cedarwood and peppermint essential oils, I make a master blend in a 1:1 ratio. I use an empty 5 mL dropper bottle and put 20 drops of each into it. This can be added to both shampoo and conditioner, or just put a drop or two on your brush before brushing the hair. When using both the essential oils and the DE with the salt, I have never had this not work. In full disclosure though, I've not had a lot of opportunity to try. We've only encountered lice a few times, and I credit this to the DE. I dust all the winter hats and scarves very lightly with the DE after each wash, and I put a few drops of the peppermint and cedarwood blend on a dryer ball in the laundry when we get one of those notices home. That probably doesn't do a lot on its own, but it does smell nice. If you're struggling with lice, please, give this a try and leave a comment!!! I'd love to know what other's experiences are with it! VibesUP at a 62% discount? For only about another day, VibesUP is still offering a 62% discount on nearly everything they sell. There are a few exceptions, but those are on already insanely discounted bundles. If you haven't tried anything from VU! already now is a great time to do so! Check out the link here: VibesUP Click on the "Shop" tab at the top and have a look at all the incredible products. Be sure to use code JANUARY62 for the 62% discount, and if you happen to live outside of the US, in the comments section put "international VIP me" for an additional 20% of the value of your order in FREE product! This is to offset the duties you will likely have to pay upon delivery. This is the ONLY company I have ever found that offers such incredible service to their customers outside of the US. In addition to all of this, make sure you sign up for their emails, because they are giving away EVEN MORE right now! You get 1pt for each 25.00 you spend on your order. EXAMPLE: Write "I spent 200.00 which gives me 8 pts. I would like to redeem my points on these items. 1 Juicy Gem bracelet Green color (1pt) 1 chakra tree (2) pts. 1 small vogel crystal (5 pts) for a total of 8 points"
Imortant: If we run out of a give away item we will substitute it for an equally awesome gift or even better goodie. If an item is limited quanity you may list a second choice or let us surprise you. **Make sure you take a look at all the goodness they are offering once you get your email. There is some BEAUTIFUL stuff if you place an order of $25 or more!! This comes to only $4.93 USD when the JANUARY62 coupon is used!! This is a pendant that I wear all the time. It's just plain pretty, and I love the energy it holds. It's really a steal of a deal at regular price, and at this discount, it's a crazy good deal! My dogs wear their pet pendants, but these gems would also be a fantastic option for pet collars! The SquishyLite's are incredible. My father (who is in his 80's) sleeps with one his lower back every night, and swears he wakes up with far more mobility than he did before having the squishy. I keep them around like coasters to charge food and drinks, and I ALWAYS carry one in my purse to have on the go. With the January62 discount, they are only $11.40 if purchased individually, or $45.22 for a five pack, costing only $9.04 each!! I nearly always have at least one of these lovely chippy gem bracelets on. This was HARD to choose! I narrowed it down to four of my top picks, but if you make it to the site, be sure to check out their Crystal Creams, pet products, bamboo charcoal pants (soooo comfy!! ), cork belt, back, wrist and knee wraps and water bottles, (hint, I keep a VU! water bottle full of water beside my diffusers so that I'm diffusing charged water with my essential oils. :) ) They also have a fantastic selection of very high end jewellery. I don't have any of them yet, but they are stunning, and I hope that one day I may call one of those beauties my own. :) Now, with the 62% discount, is a FANTASTIC time to indulge if you're looking for a stunningly beautiful piece of crystal jewellery! **Full disclosure, the link provided above is an affiliate link. I only affiliate with companies that I trust and believe in. If you make a purchase through this link I do make a commission, but you don't pay anything more for your order. Thank you for supporting The Pure Oil! I had read about a decade ago about Colloidal Silver. It interested me, but sounded too good to be true. At the time I was a busy mom and the thought to buy a bottle was put on the back shelf in my mind. It's not like it was jumping off store shelves at me anyway. When I finally DID find it at a store (about 8 years ago), I paid $23 for about 5-6 ounces of the stuff. It came in a dark brown plastic bottle with a pretty silver label. I brought it home and promptly shelved it; I was afraid to actually use it. Then one day in the following months we found that our cat had a really bad infection from a cat fight. I wish I had pictures to share, but I don't. He was a rescue and although I don't condone sending cats outdoors overnight, and I try to keep mine in since we have coyotes in the area, this guy is determined, and he loved the outdoors. Anyway, he'd been in a fight and days passed before I noticed the problem, because I was always with a baby on my hip and two little guys running around. And the dog was ALL OVER the cat. She was constantly loving him up. Turns out, she was trying to fix his wounds! At this point, with his ear swollen up and red and oozing green exudate, I decided it was worth 12-24 hours with this silver stuff on the cat before I'd take him to the vet. I had no expectation that it could work that fast, but figured if I could see reasonable improvement and if he was doing well at the 12 hour mark, we'd give it a day or two. What followed blew my mind! I saturated a few cotton balls and held them over the area for as long as he'd let me. (probably 10 minutes or so). I did this about 5-6 times the first day. I also poured 1/2 tsp of it into the palm of my hand and he lapped it out, just like it was water. Honest to goodness, no word of a lie, by that night, it was no longer red. There was no more exudate and the swelling had almost disappeared. By mid next day, fur was starting to come back in. Seriously. I know it sounds unbelievable. I didn't believe it. My husband didn't believe it. We both wished we had pictures. This hasn't been the only time this stuff has saved this particular cat either. He's still with us today. :) It changed my mind about colloidal silver. For the next four years I purchased several brands, all with satisfactory to excellent results. But IT WAS EXPENSIVE. I'd read about people making their own and thought that was just crazy. Then one day I came across TheSilverEdge.com and realized that there are companies out there that produced GENERATORS that were designed for the lay person at home to use. There are specific (easy) instructions, and so long as you follow them, you can quite literally make a quart (litre) of colloidal silver that is EASILY as good as any you will find on a shelf, and I would argue EVEN BETTER in your own kitchen in three hours for less than 40 cents US...so way less than a dollar Canadian. Hello?? After a load of research and looking at a few generators, about 4 years ago I jumped in and bought The Silver Edge Microparticle Colloidal Silver Generator. I have never regretted it. I make silver for my entire family, four sisters (one of them has a horse who uses it sometimes!) and their families, my parents, and anyone else who uses it. The reason for this post today, is to share this incredible offer. I was too late to share it initially, but since they've extended the deadline on the offer to December 18th, I wanted to get this up ASAP. Full Disclosure: If you chose to purchase one because of my pointing you in this direction, please use the code THEPUREOIL at checkout. I have an affiliate account with them. You too can sign up for a free affiliate account and spread the word! When I bought mine I didn't get all the 'extra stuff", but it was still worth EVERY PENNY and more. I have so many stories of seeming "miracles" that stemmed from having this generator and the ability to share CS with anyone wanting to try it. Prior to buying this generator, I was purchasing SilverBiotics brand from Swanson online from the US. It too was worth every penny and saved my family much trouble, but honestly, the cost difference is unbelievable. I would purchase another generator over going back to buying by the bottle. Please see below for more information directly from The Silver Edge. On a Brand New Micro-Particle Colloidal Silver Generator! And You'll Get $152.65 Worth of Valuable Bonus DVDs, CDs, Books and Special Reports on Making and Using Colloidal Silver! It's a bona-fide $152.65 value. And it's all designed to have you making and using colloidal silver like you've been doing it all of your life, starting thesame day you get your new Micro-Particle Colloidal Silver Generator! The offer is extended only until December 18th – Midnight, so please actquickly and decisively while there's still time. There will be no further extensions. Remember, use the code THEPUREOIL at checkout! I am a Young Living Independent Distributor, which means I buy my essential oils at the wholesale price rather than the retail price. I save 24% off retail, receive discounted shipping, and can earn free products through the Essential Rewards program as well as the ability to earn commissions. If you would like to become an Independent Distributor, I would love to sponsor you! You can click HERE and enter 2066298 in the “Sponsor and Enroller ID” boxes. I am always happy to answer any questions! This months promo is a great one to keep everyone at peak performance through our Canadian winters! Receive up to $316.71 in retail value products FREE with November’s PV Promotion! There’s no time like the holidays to bring increased balance and harmony to your body, and essentials for restocking your Raindrop will do the trick! A revolutionary means of harnessing physical, mental and emotional balance, the Raindrop Technique® combines the art of aromatherapy with Vita Flex and massage techniques in the application of essential oils. With the busy holiday season fast-approaching, harness your energy with November’s promotion and rejoice with the power of Raindrop. 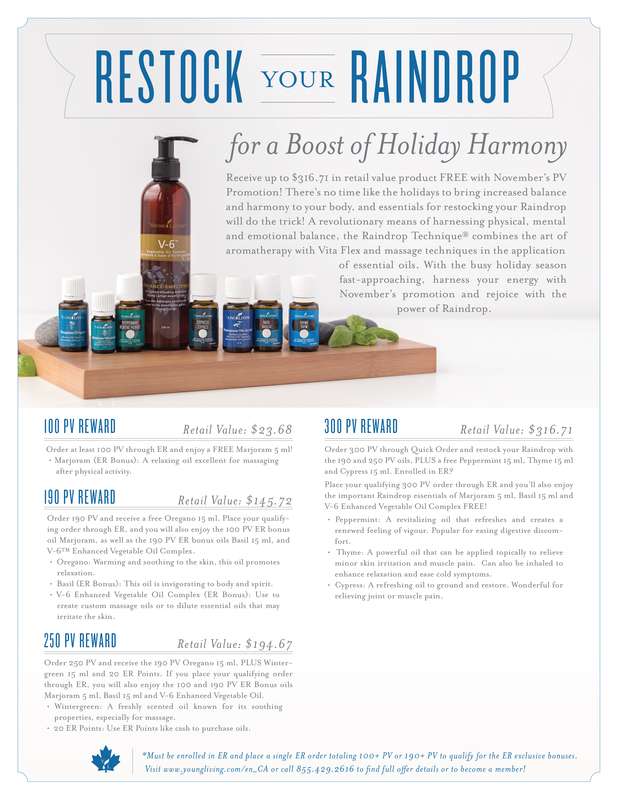 Reach any of our PV minimums in your November order to qualify for these Raindrop freebies, which now include an additional Essential Rewards (ER) exclusive bonus for members who reach 100+ PV or 190+ PV in a single November ER order. Not enrolled in ER? Learn more and enroll today to access exclusive Young Living® loyalty perks. Introducing a new 100 PV ER exclusive bonus reward! Order at least 100 PV through ER and enjoy a FREE Marjoram 5 ml! Marjoram (ER Bonus): A relaxing oil excellent for massage after physical activity. ER Orders: Limit of one free Marjoram 5 ml per qualifying order. Order 190 PV and receive a free Oregano 15 ml. PLUS if you place your qualifying order through ER, you will also enjoy aBasil 15 ml, V-6™ Enhanced Vegetable Oil Complex and Marjoram 5 ml as a special ER bonus! Oregano: Warming and soothing to the skin, this oil promotes relaxation. Basil (ER Bonus): Known for its strong, spicy aroma, this Raindrop oil is invigorating to the body and spirit. V-6 Enhanced Vegetable Oil Complex (ER Bonus): May be used to create custom massage oils or to dilute essential oils that may irritate the skin. Quick Orders: Limit of one free Oregano 15 ml per qualifying order. ER Orders: Limit of one free Basil 15 ml, V-6 Vegetable Oil Complex and Marjoram 5 ml per qualifying order. Order 250 PV and receive a free Wintergreen 15 ml, Oregano 15 ml and 20 ER Points. If you place your qualifying order through ER, you will also enjoy a bonus Basil 15 ml, V-6 Enhanced Vegetable Oil Complex and Marjoram 5 ml. Wintergreen: A freshly scented oil known for its soothing properties, especially for massage. 20 ER Points: Use ER Points like cash to purchase oils of your choice. Quick Orders: Limit of one free Wintergreen 15 ml, Oregano 15 ml and 20 ER Points per qualifying order. Order 300 PV through Quick Order and receive a free Peppermint 15 ml, Thyme 15 ml, Cypress 15 ml, Wintergreen 15 ml, Oregano 15 ml and 20 ER Points. Place your qualifying 300 PV order through ER and you’ll also enjoy the important Raindrop essentials of Marjoram 5 ml, Basil 15 ml and V-6 Enhanced Vegetable Oil Complex FREE! Peppermint: A revitalizing oil that refreshes and creates a renewed feeling of vigour. Popular for easing digestive discomfort. Thyme: A powerful oil that can be applied topically to relieve minor skin irritation and muscle pain. Can also be inhaled to enhance relaxation and ease cold symptoms. Cypress: A refreshing oil to ground and restore. Wonderful for relieving joint or muscle pain. Quick Orders: Limit of one free Peppermint 15 ml, Thyme 15 ml, Cypress 15 ml, Wintergreen 15 ml, Oregano 15 ml and 20 ER Points per qualifying order. ER Orders: Limit of one free Basil 15 ml, V-6 Enhanced Vegetable Oil Complex and Marjoram 5 ml per qualifying order. Offer is valid from 12:00 midnight, MT, November 1, 2016, to 11:59 p.m., MT, November 30, 2016. I'm a busy wife and mom of three who has a background in the healthcare field. In recent years my interest in health and well-being for not only the humans in my family, but also for my furbabies has really become a focus for me. The more I learn, the more I want to share what I've learned to help others become their best selves as well. This is what prompted me to become a certified EFT practitioner. In my search for a healthier lifestyle, I found EFT and Young Living Essential Oils. They work together like they were made for each other! Among many other things we use on a daily and weekly basis at home to keep everyone healthy, these two are at the top of the list! I hope you will feel free to contact me with any questions, and visit my website www.thepureoil.com for more information on EFT. You're welcome to email me at thepureoil@gmail.com I'm here to help!